The Research Instrumentation Facility (RIF) is equipped with a wide variety of instrumentation for chemical analysis including NMR, optical spectroscopy, thermal analysis and GC-MS. 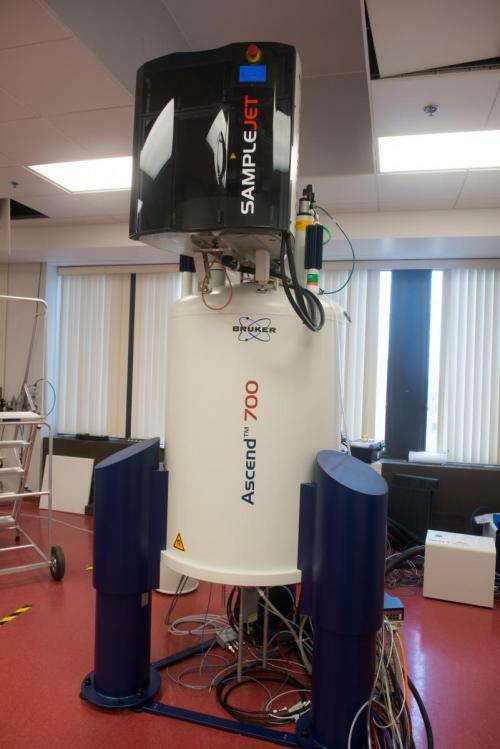 The Bruker Avance III-HD 700 MHz spectrometer is the latest addition to the RIF. The instrument features a quadruple resonance QCI-P cryoprobe (1H, 13C, 15N, 31P with 2H lock and decoupling) and a SampleJet automated sample changer. 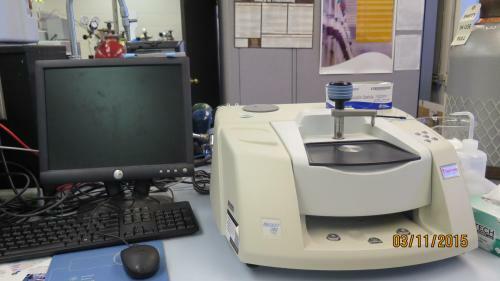 This new spectrometer, installed in December 2013 greatly increases sensitivity for metabolomics research and will support fundamental studies in such broad areas as chemical synthesis, molecular evolution, signaling pathways, metabolism and other cellular processes. The 700 MHz Avance III-HD NMR features 32 shims, which significantly improves line-shape by enhancing field homogeneity across the sample. In addition, the Bruker 700 MHz features state-of-the-art software, allowing for non-uniform data sampling (NUS) with improvements in sensitivity and spectral resolution. NUS dramatically decreases experimental time for multidimensional NMR experiments. A complete set of standard triple-resonance NMR experiments used to assign a protein structure that would normally require weeks of dedicated NMR instrument time is reduced to a single day with the new instrument. 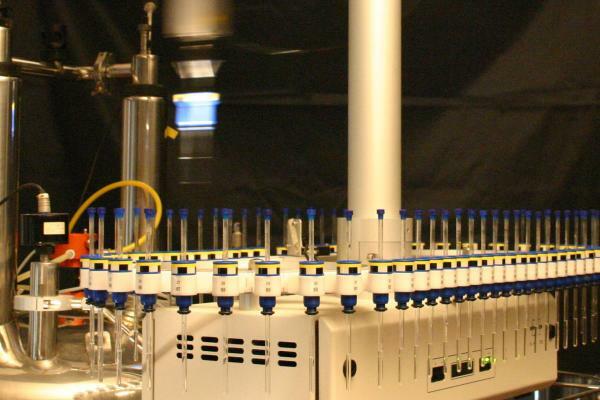 The SampleJet automated sample changer that can accommodate over 500 NMR samples for HTS (high throughput screening). Additionally, an internal NMR thermometer that directly measures and continuously the actual sample temperature in real time. Since multidimensional NMR experiments actually lead to sample heating and since peak position, line-shape and field homogeneity are all temperature dependent, the NMR thermometer significantly improves the accuracies of signal frequencies. 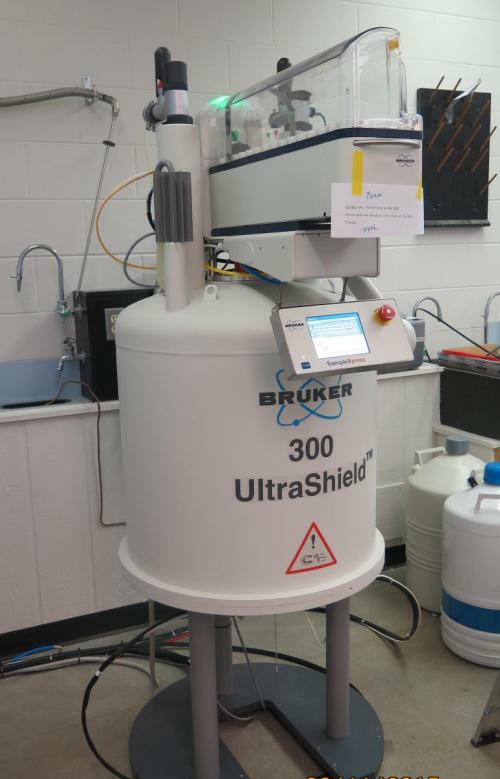 The 600 MHz Bruker AVANCE spectrometer is a 5 channel NMR system capable of doing both solids and liquids NMR. It has triple-axis gradient enabling us to perform sophisticated gradient experiments involving multiple nuclei. The instrument has full-broadband capabilities and a Variable Temperature unit for performing high and low temperature experiments. This system has a very good selection of probes available for special projects. The system has a Bruker BCU 05 cooling unit that enhances our ability to run samples near room temperature with good temperature stability. The 14.7 Tesla magnet provides the higher resolution that is frequently required for running complex biological molecules. 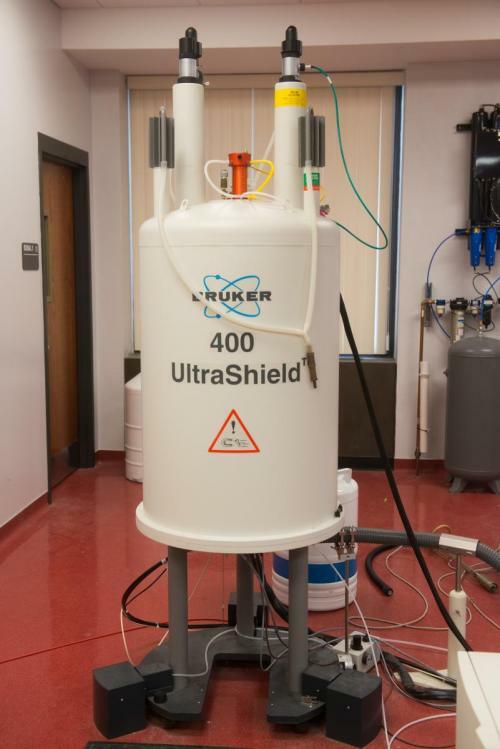 The 400 MHz NMR is our most active walk-up system meeting the sample analysis needs of many of the synthetic organic research groups. The console was replaced in December 2012. It has a BBOF probe with an ATM (automated Tuning and Matching Accessory). The instrument has automated shimming with topshim. The system has Z-axis gradients and is capable of running Variable Temperature experiments. This makes acquiring 2D and variable temperature NMR easy. 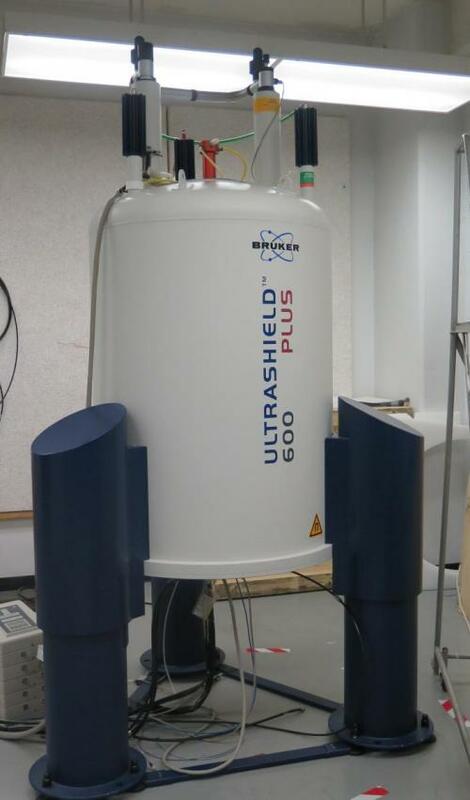 The 300 MHz NMR is a walk-up system meeting the sample analysis needs of many of the undergraduates and synthetic organic research groups. The console was replaced in May 2014. It has a BBOF probe with an ATM (automated Tuning and Matching Accessory). The instrument has automated shimming with topshim. The system has Z-axis gradients and is capable of running Variable Temperature experiments. This makes acquiring 2D and variable temperature NMR easy. The system has a SampleExpress sample changer with 60 places. Undergrads can submit samples to the sample changer for NMR data for many undergraduate laboratory classes. The instrument is jointly shared between the Research Instrumentation Facility and the UIC. Reservations for the system can be made online. 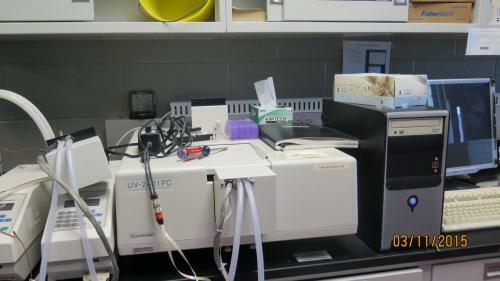 The Shimadzu UV-2401 UV-VIS spectrophotometer is a standard research-grade UV-VIS, capable of scanning from 190-900 nm. The resolution is 0.1 nm with the bandwidth selectable from 0.1 nm - 5 nm and a range of scanning speeds. The software is capable of acquiring data in spectrum mode, as well as photometric and kinetic data. There are two cell attachments available besides the standard 2-cell sample/reference holder. There is a 12-cell sample changer that will hold standard 1 cm x 1 cm cuvettes with optional stirring and temperature control, as well as a 16-microcell sample changer with temperature control that can hold from 70-100 uL of sample in each compartment. CD measures the differential absorption of the left and right hand components of circularly polarized light. The Jasco815 covers the 163 nm to 700 nm wavelength range. This system also has a flow cell that allows for kinetic studies in a stop flow mode. CD is used to study molecules that have secondary structure such as b-sheet and a-helical structures in proteins, DNA and some large molecular assemblies. The normal sample configuration is a standard 1 cm x 1 cm cuvette. The Shimadzu Fluorimeter is a basic fluorescence instrument capable of both excitation and emission spectral scans from 220-900 nm. It has a wavelength accuracy of 1.5 nm, selectable bandwidth for both excitation and emission, and variable scan speeds. 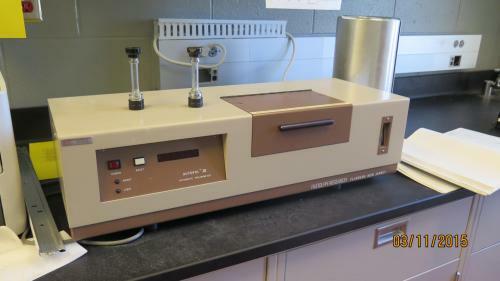 It can also be used for kinetics and phosphorescence experiments. The normal sample configuration is a 1 cm x 1 cm cuvette. 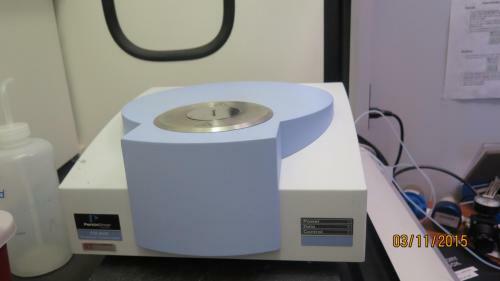 This polarimeter will determine optical rotation through +/- 89° arc with a resolution of .001°. There are filters for observing at 365, 405, 436, 546, 589, or 633 nm. This is an microscope that can be used to detect the IR spectrum in a small pixelated area. This allows us to study materials and cells using infrared spectroscopy. The instrument is a routine-use, mid-IR (~400-4000 wavenumbers). The maximum resolution is 0.5 wavenumbers. The instrument is easy to use, and is equipped with a variety of sampling accessories. The standard configuration is the SmartPerformer ATR accessory with a diamond crystal, which allows easy liquid or solids IR acquisition. Also available is a diffuse/specular reflectance (DRIFTS) accessory for sampling of bulk powders. 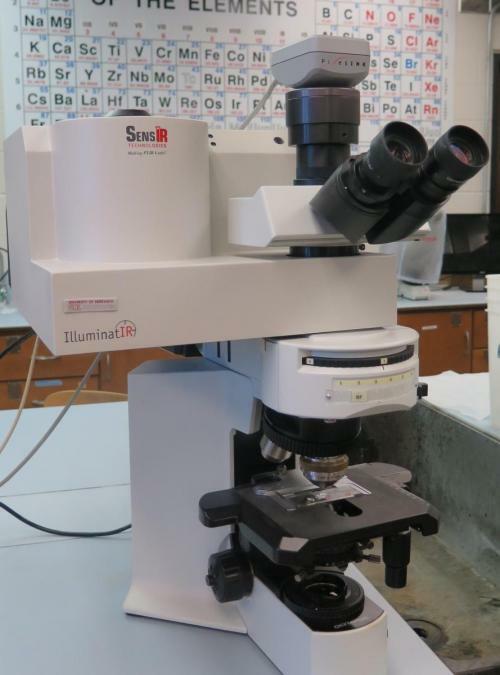 The Leica optical microscope is used by undergraduate and research labs. 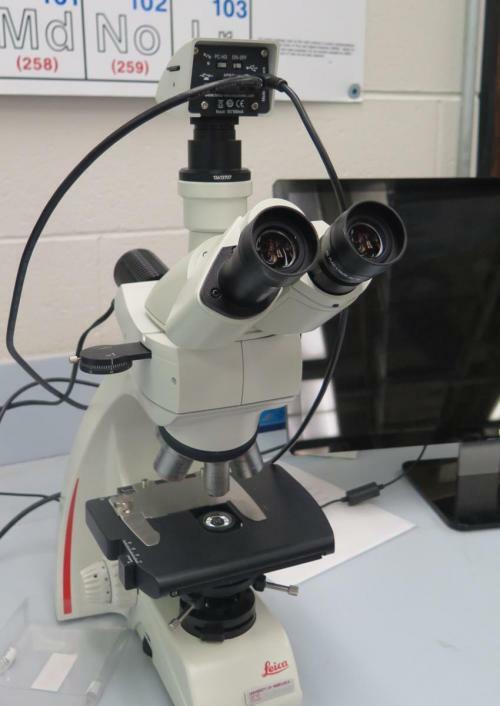 The microscope is fitted with a digital camera for better observation of a surface. 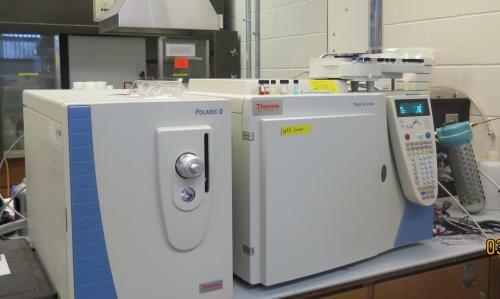 This GC-MS is shared between the undergraduate and graduate research facilities. 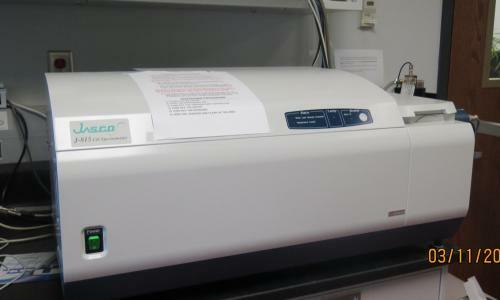 It has an autosampler that can hold up to 108 samples for automated acquisitions. The observable mass range is up to 1050, with unit mass resolution. It can be operated in either the EI or CI mode. An EI-only NIST library is available on the computer. 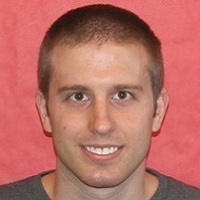 This system is web enabled and can load the data to UNL's Blackboard site. 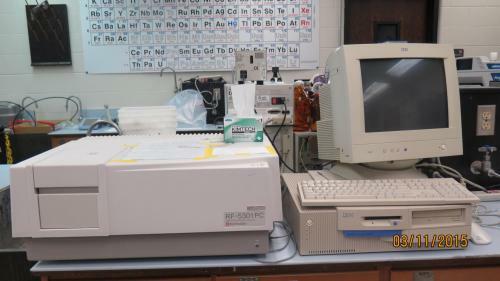 This GC-MS is located in 414 Hamilton Hall. The STA is a simultaneous thermal analyzer which allows users to obtain TGA and DSC data. The temperature range is from 20°C through 1000°C. The system is operated under computer control to allow for programming of temperature profiles. Samples can be heated under nitrogen or air. Other purge gases are possible upon request. Approximately 10 to 20 mg of sample is the standard size for analysis. 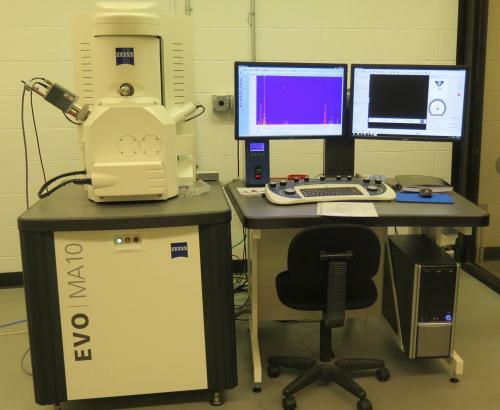 This Zeiss EVO MA10 Scanning Electron Microscope allows students to looks at materials and detect elements on the surface of the samples by XRay Dispersion Spectroscopy. The NMR acquisition software is installed on several workstations as well for offline data analysis. Each workstation is equipped with the full Microsoft Office suite for data processing and document editing and Adobe Acrobat for saving documents as PDF files. SDBS - Searchable spectral database for organic compounds, compiled by the National Institute of Advanced Industrial Science and Technology in Japan. 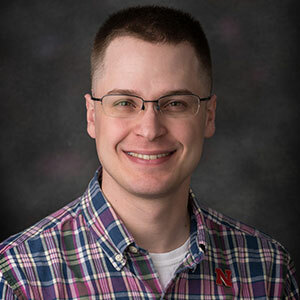 Practical NMR Spectroscopy - Tutorial by Dr. Keith Brown. An introduction to the mathematical treatment of NMR. 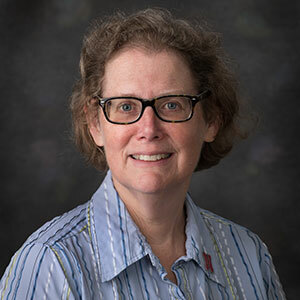 Lee, J., Bartlet-Hunt, S., Li, Y., Morton, M. “Effect of 17β-estradiol on stability and mobility of TiO2 rutile nanoparticles”, Science of The Total Environment (Impact Factor: 3.16). 04/2015; 511. DOI: 10.1016/j.scitotenv.2014.12.054. Vo, T. H., Shekhirev, M., Kunkel, D. A., Morton, M. D., Berglund, E., Kong, L., Wilson, P. M., Dowben, P. A., Enders, A., Sinitskii, A. “Large-scale solution synthesis of narrow graphene nanoribbons”, Nature Communications, 2014, 5:3189. DOI: 10.1038/ncomms4189. Higher field gives better Signal-to-Noise and better signal dispersion, so 700>600>500>400>300 MHz. Linewidths in Hz are similar whatever the field, so the linewidths in ppm are smaller at the higher field strengths, unless a frequency-dependent line broadening mechanism interferes. Probes optimized for a particular nucleus give the best signal to noise ratio (S:N) for that nucleus. The cryoprobes on the 700 MHz are indirect detection probes with the 1H electronics cooled to reduce thermal noise, and is thus most sensitive to proton. The 300 and 400 MHz have BBO-F probes with automatic tune and match (ATM). A wide range of nuclei are available on these probes. The give better resolution than prior probes due to the ATM and better receivers. Availability: H1 experiments are available on all instruments. Gives information about pairs of protons that are J-coupled. This usually indicates that the protons are on adjacent carbons, e.g., 3-bonds away (though protons further apart may in some cases be J-coupled). Gives information about strong proton-carbon J-couplings. A strong proton-carbon J-coupling indicates that the proton is directly bonded to the carbon. This experiment gives information that is identical to HETCORs or HMQCs, which are less sensitive. Additionally, it gives DEPT editing (color encodes – CH and CH3 versus CH2). Gives information about weak proton-carbon J-couplings. A weak proton-carbon J-coupling indicates that the proton is two, three, or four bonds away from the carbon. This experiment gives information about which protons are near to (but not directly bonded to) different carbons. This experiment (in conjunction with the HSQC) can give an enormous amount of information about molecular structure, since the long range proton-carbon correlations can include quaternary carbons, in addition to protonated carbons. The BBO-F probes will need to be tuned to 31P before acquisition with atma. The 600 BBO probe must physically be tuned to 31P. Sensitivity is approximately 15 times less than for proton, so adequate Signal-to-Noise for a reasonable length experiment (10 minutes, 256 scans) requires a concentration of > 0.1mM. The 400 and 300 MHz BBO-F probe is well-suited for direct observe 19F experiments. Tuning these probes to 19F uses the atma command. The 600 MHz NMR with the H/F probe gives the best sensitivity for 19F. Sensitivity is approximately the same as for proton, so adequate S/N can be obtained with concentration > 0.1mM. Setup is exactly like direct observe 19F, only F2 is 1H and uses Waltz 16 decoupling. The Research Instrumentation Facility (RIF) in the Department of Chemistry is equipped with a wide variety of instrumentation for chemical analysis including NMR, optical spectroscopy, thermal analysis and GC-MS. Our primary mission is to support the research within this department and the wider University system but we are additionally available to support the analytical chemistry needs of other academic institutions, research laboratories, businesses and individuals. 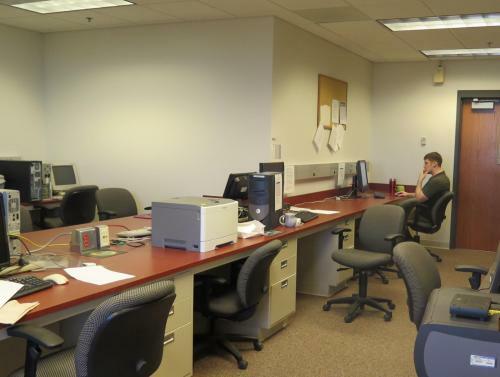 We are available to run samples and compile data or reports as necessary. Self operated rate is only available to academic customers after training is completed. Training is only offered to academic customers and only when they are expected to have long-term consistent usage. Discounts are available for industrial customers purchasing monthly blocks of time on a yearly basis. NMR tubes, solvent and any other supplies consumed in acquiring data will be charged back to the customer for all samples. For submitted samples any requested sample preparation, data work up and/or interpretation time will be charged at the above rate. For submitted samples there is no minimum charge, only the actual time used will be charged in fractional hours. State Sales tax will be added to all services and supplies for entities which are not tax exempt.